A group of trust anchors. Definition at line 51 of file trust-anchor-group.hpp. Definition at line 39 of file trust-anchor-group.cpp. Definition at line 66 of file trust-anchor-group.hpp. Definition at line 48 of file trust-anchor-group.cpp. Definition at line 54 of file trust-anchor-group.cpp. Definition at line 84 of file trust-anchor-group.hpp. Referenced by ndn::security::v2::StaticTrustAnchorGroup::add(), ndn::security::v2::DynamicTrustAnchorGroup::refresh(), and ndn::security::v2::StaticTrustAnchorGroup::remove(). Definition at line 85 of file trust-anchor-group.hpp. 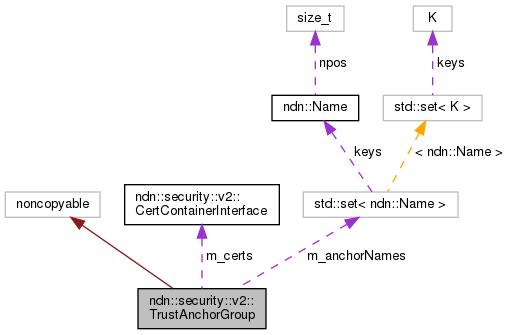 Referenced by ndn::security::v2::StaticTrustAnchorGroup::add(), ndn::security::v2::DynamicTrustAnchorGroup::refresh(), ndn::security::v2::StaticTrustAnchorGroup::remove(), and size().